This is a striking picture from an intense documentary project, can you set the stage and let us know a little bit about the image and the project itself? This image is one of the earliest I made of Hector Garcia Jr. when I began photographing his journey to lose weight and try to change his life. I asked what some of his hardest moments were daily and he said just getting up and moving around, getting to the bathroom from his chair so I asked to photograph that. That relatively active afternoon included his mother cutting his hair in his room then washing him in the bathroom. From my first conversation with Hector, I was blown away by how articulate and open he was about his lifelong struggle. He explained the cycle of obesity in ways I knew people would relate to and understand. The still pictures were unknown at this point but his voice was what definitely needed to be heard so I recorded audio and video from the beginning. I knew multimedia would be the most powerful way to tell his story. As San Antonio Express-News enterprise editor Audrey Lee says, I became the chronicler of his life. I never intended to work on this story for four years but after following his dramatic weight loss, I was waiting for a clear ending, one I thought would be a weight loss success story with him moving out on his own, dating, working outside the home, etc. After his knee surgeries he lost his motivation and his story changed course unfortunately. You've done a lot of these long-term projects throughout your career. What have you learned about yourself in the process of projects like this? I think long-term projects take a core personal belief in the importance and potential impact of the project. I know I have a high level of patience and self-motivation when it comes to stories I believe in. The key is staying dedicated to those stories. Then you have to be relentless about getting them published. I joke that sometimes the paper runs stories just to shut me up. Luckily, I have a Director of Photography, Luis Rios, who trusts me and gives me the freedom and time to work on projects. I’ve also learned it is impossible for me not to get emotionally involved. In the first years of my career, I tried to distance myself, thinking that was more professional. I realized my emotional involvement probably made me a better photojournalist and stopped trying to fight it. That said, I have a tendency to become overly emotional and especially after Hector’s death, I was so emotional it was very difficult to shoot. The photos after his death were definitely the hardest photos I’ve ever had to make. I kept telling myself I had to do this for Hector; he wanted me to finish his story if he died. He told his family and I that multiple times. I also kept Michel du Cille’s words close to my heart, “This is what we do." Since this image is part of one of your larger projects, can you talk about the beginnings of it? How did it differ from others, and how was it the similar? Hector’s story came to me through his sister, Rebecca. She was originally looking for a mentor for her daughter and had gotten my name from Alicia Wagner Calzada. I was going to be out of town for a few weeks and told her I could meet with her daughter when I returned. During that time, she emailed me saying she feared her brother would not live unless he got help. I met with him as soon as I was back in San Antonio and I began photographing him, unsure what story we could do. When I began photographing Hector, he was very motivated to lose weight and I began working on it as weight loss story, envisioning a happy ending, as I am prone to do. The questions I’ve asked myself repeatedly, especially since his death are: should we have done a story right away? Would he have gotten help? Would he have lost weight and regained it regardless? Some projects are hard to get access to; often it takes time to build trust and to begin making pictures. With Hector, it was an immediate partnership. It was probably the most I’ve ever felt that way. The access was almost instant. He believed in telling his story and I believed in telling it and we moved forward with that collaboration. He always said he wanted to have a purpose, for his life to have a purpose. He was driven by his almost desperate desire to keep others from his own fate. He felt this way especially about children and hoped parents would see his story and change the habits of their children. This is undoubtedly his reason for opening his life to me, to help others. The challenges were the usual ones, like how to work on a story the paper isn’t really interested in yet, around the daily assignments and around the intense workload of stories the paper has assigned me to, has high expectations for and a more immediate deadline for. That is the endless struggle with almost all stories, even when the story has complete support. I’m lucky in that organizing all of it is left up to me but it can also be very overwhelming to try to do it all. I always kept in touch with Hector but I rarely photographed him in 2013 because I was traveling for the Military Sexual Assault project, Fort Hood shooting survivors project, producing both projects then my husband was in a serious accident in August of 2013 so I didn’t work on projects for the rest of the year. By the time I regrouped in early 2014, Hector was depressed and gaining weight again. His motivation would come and go and he lost about 50 lbs early in 2014 but when I realized his situation was not improving I began pushing for publication. It wasn’t the happy ending we hoped for, but maybe it was more realistic look at the cycle of obesity. Weight loss success stories are widely published but the true outcome for many is the opposite. Luckily, I was able to usually photograph Hector on my time off, his weigh ins were every Monday so if I was in town I would go every Monday morning and he went to the YMCA at 6 am so I could be done before my 8 am shift. I am not forced to do this but I feel it’s unfair for me to ask for that much time when I’m shooting the same thing over and over. It was the way I kept engaged with Hector’s life, even though I knew I usually wouldn’t make a picture that would add to the narrative. But there is always a chance and that’s what got me up at 5 am to follow him to the pool. The first time I really had to ask for a day off was the day of his first knee surgery and if I had free time during my shift I would try to see him. That said, I was always working on several other stories at the time so it was always a juggling act, one I’m not that good at. Since Hector was basically confined to his chair when I first started photographing him, obviously I needed to photograph him doing anything out of the chair. His mother was going to cut his hair so I photographed that and he had to get all the hair washed off him, which his mother had to help him with. It was one of the first times I really photographed him. I remember thinking the moment was really beautiful, with how gently and lovingly she washed him. There was so much struggle. I really hadn’t seen him up and moving out of his chair that much yet and everything was just hard. I could really see how difficult it was for him to just walk a few feet. His knees caused him so much pain, it was relentless so the only relief he got was when he was sitting. That doesn’t help someone who is trying to lose weight; it makes exercise nearly impossible when it gets to that level. Can you tell us the recent news of Hector and how you handled it? I had been at Hector’s house a couple of hours earlier. I was finishing the multimedia for his story’s publication date, already set for Dec. 28 and my friend Christena Dowsett had come down from Dallas to help me finish it. I wanted them to meet, as she felt very impacted by his story, both from seeing it at Visa pour l’Image and viewing the video the previous week when I was on assignment in Dallas. In fact, she filmed the screening for me so I could show it to him. I took her to meet him and we spent a couple of hours just having a great talk. We talked about everything from his deepest feelings to the reality show, 90-day-fiance, which Hector and I were both entertained by. We left around 5 and ran a couple of errands. We got back to my house and got ready to start editing and I got a call from his mother wailing, “We lost Hector, We lost Hector.” She was so distraught I couldn’t understand her at first. I told her I was on my way; we jumped in the car and raced to his house, a 30-minute drive. Seeing the scene, honestly, I wailed and wailed. I was that person we photograph when they arrive at a scene. I was not able to take any photographs inside because his doctor never called back and the police had to keep it as a scene under investigation. I’m still emotional about it daily; especially when I think about Hector not seeing the impact his story has had. That is just devastating to me. That, and the guilt I feel for not publishing his story sooner and possibly helping him and preventing his death. What do you think Hector would like others to know about him? Hector would want people to know how big his heart was, how much love he had to give. He was truly a gifted writer and only wanted to help people. He was so much more than his exterior but most people never gave him a chance based on his appearance. Even in the depths of his pain, he always had a smile and a laugh and cared much more about the people around him and how he could help them. I see a lot of reporters and photographers getting discouraged if their editors don’t get engaged with the stories they are working on and don’t encourage them. It can’t be about that. It’s you and the person/people/community you are photographing and their story. You have to find it inside yourself to keep pushing for what you believe in. Do not let others discourage you from telling the stories you believe in. Lisa Krantz is a staff photographer at the San Antonio Express-News. 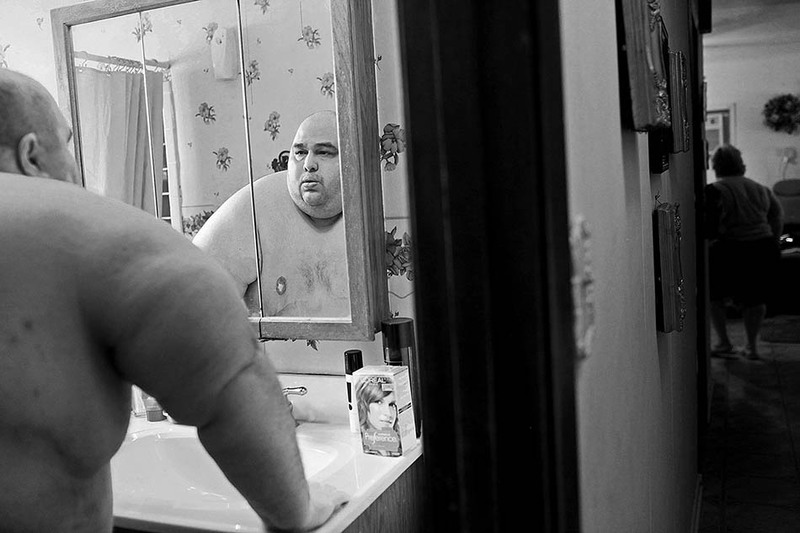 In the 2015 Pictures of the Year International (POYi) competition she was awarded second place Issue Reporting Picture Story-Newspaper for “A Life Apart: The Toll of Obesity,” the story of Hector Garcia Jr.’s struggle with obesity, and she was named third place Newspaper Photographer of the Year. 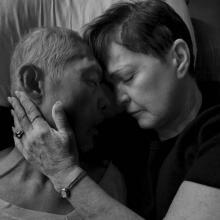 Hector’s story was also shown in a screening at Visa pour l'Image, the photojournalism festival in Perpignan, France in 2014. In 2014, her photographs of survivors of Military Sexual Assault received several awards including first place Issue Reporting Picture Story-Newspaper in POYi. In 2010, her project on Sam Houston High School, an inner-city school threatened with closure, garnered recognition including the 2010 Scripps Howard Foundation National Journalism Award for Photojournalism and third place POYi Newspaper Photographer of the Year in 2010 as well. She also received the Scripps Howard Foundation National Journalism Award for her portfolio in 2012. 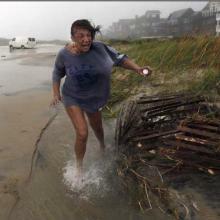 She is a three-time NPPA Region 8 Photographer of the Year and her work has also been recognized by NPPA’s Best of Photojournalism, the Casey Medals for Meritorious Journalism and the National Headliner Awards. 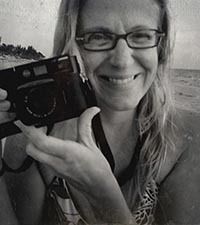 She has a psychology degree from Florida State University and a MA in photography from Syracuse University. Previously she worked at the Naples (FL) Daily News.